Sjoe! is all I could say when this album arrived a few weeks ago and as I was adding it to our playlist I thought who in the world is Dongfeng Liu a totally new name to me and kinda gave little thought to it, it was on our playlist and continued add all the other new release’s to the playlist. You see it is not that often that I get the chance to listen to a full album in one sitting other than when I choose to write an album review. Like all of our presenters here at All Jazz Radio most of my listening happens when I program all of the shows that I compile on a daily basis. Who said running a small independent online Jazz, Blues, Latin and World Jazz radio station from little ol’ Cape Town was easy. As the sole fulltime volunteer with absolutely no resources whatsoever, I can tell you it ain’t, nuff of those sentiments. Usually I look for the new and unusual stuff to listen to, however, this one was finally noticed when I played the track Arcadia during my show. It’s not that often that something say’s jinne and captures me totally as this track did. Sadly it’s taken me a few weeks to “discover” the full album and to actually set time aside to sit down and really listen China Caribe. At first I did not know how or where to categorise what I was hearing out of the speakers, but what I heard was an intriguing fusion from China, Cuban and Mongolian roots and instrumentation. I was immediately hooked from the opening refrains of the first track In The Clouds and knew that I had found something very special in China Caribe. I knew too that I was going to be listening to and introduce to friends, family and our fans for a long time. Each track offers an enjoyable listening experience with the journey being extremely enticing. The amalgamation of ChiMongCu and is a synthesis that just works so well. I love it and I think many will too. 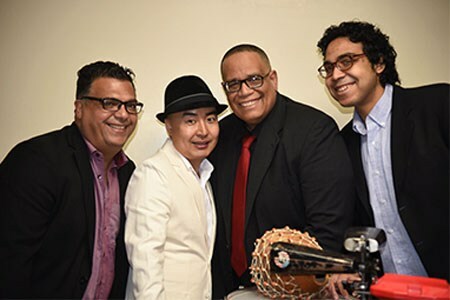 L to R: Roberto Quintero, Dongfeng Liu, John Benitez, Francis Benitez. Photo: Melanie Futorian. 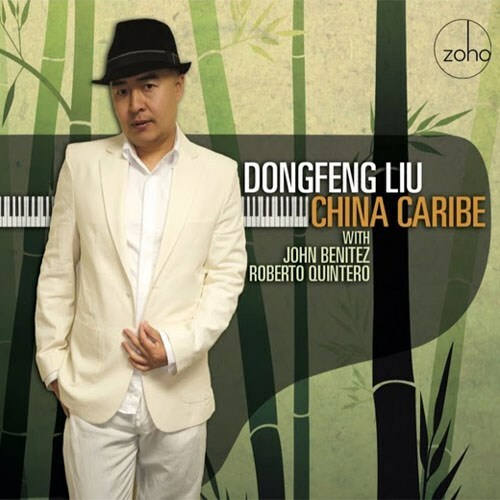 Personnel: Dongfeng Liu Piano; John Benitez Electric bass, Acoustic bass; Roberto Quintero Percussion # 1 – 5, 7; Francis Benitez Drums; Min Xiaofen Ruan # 1, Pipa # 3, 5; Feifei Yang Erhu # 7. Special Guests:Hanggai Band Mongolian horsehead fiddle, Mongolian throat singing # 1. Release Date: June 8, 2017. Produced byJohn Benitez, Kabir Sehgal and Doug Davis. Recorded on October 24, 2017 at Teaneck Sound, Teaneck, NJ. Recorded, Mixed & Mastered by Brian Chirlo. Art direction and Package Design by Jack Frisch. Photography: Melanie Futorian. Liner notes: Kabir Sehgal. Executive producer: Joachim “Jochen” Becker.